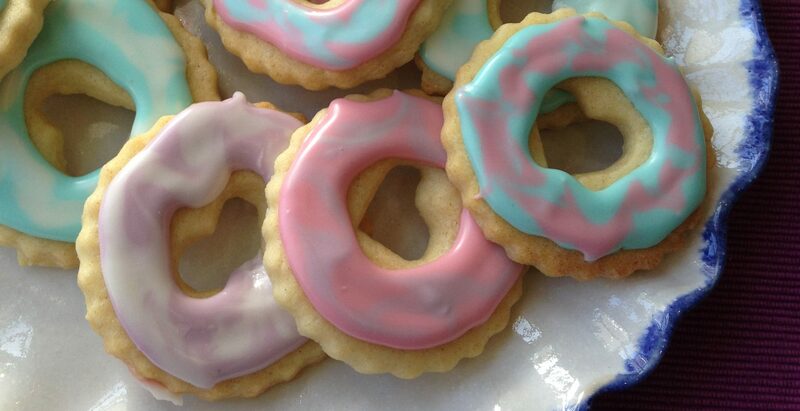 There aren’t many biscuits which are more appealing to children than party rings. Their pastel hued iced tops immediately give the impression of an occasion, to expect pass the parcel and balloons to magically appear. They’re certainly not the healthy option but I think most people have memories of party rings as children. Whilst being milk and egg-free they may contain traces of nuts, so poor little Sofe can’t dig in when the plate of party rings appear. She has to sit back and politely say ‘no thank you’ when everyone else dives in with gusto. They’re also not veggie friendly so even if I was tempted I couldn’t indulge in a trip down memory lane! These vanilla flavoured crunchy biscuits are the perfect carrier for the shiny, crisp iced top. Of course you don’t need to do the multiple colours, they’re just as tasty with a single colour icing, but I went to town with the colours to try to recreate real party rings as best as I could. The icing takes a while to set, so if possible leave them to harden and dry out overnight before packing them up. It might seem odd to put them back in a low oven once iced, but it really does help give a shiny, smooth finish and despite what common sense says, the icing doesn’t melt! makes lots, at least 28! Sift together the flour, cornflour, salt and baking powder. In another bowl whisk together the fat, spread and sugar until light and fluffy. Add the extracts and oat milk and whisk again. Colour as desired. I split the mixture into four, and then coloured each with natural food colouring. Using a plain nozzle pipe one colour onto the rings, then pipe another colour on top and feather together the colours. Hi Lucy – these so caught my eye because they reminded me of a biscuit from my childhood that I can’t remember the name of! Were they party rings? Iced biscuits are definitely a trip down memory lane to childhood! I can’t remember the name Lucy – may be they were just called party rings….I just remember the look and taste!